Last Friday my friend Barb invited me on a full moon hike to the top of Sugarbush. It turns out that for the past decade or so, she and a rotating roster of friends have aimed to ascend the mountain on every full moon, whether by hiking, snowshoeing or skinning up on skis. It's a great tradition made even better by a potluck picnic at the top, lit only by the stars and the moon. I was excited for my first evening hike and the prospect of glimpsing an elusive bull moose known to reveal himself on the hill at dusk. Just in case, I packed my camera with its widest lens, hoping to capture the imposing creature in the full majesty of his habitat. Then I threw together a hearty salad and grabbed a bottle of white wine I had placed in the freezer for a quick chill. Except for Barb's dog Willie it was a ladies-only 6:30 P.M. turnout, so Barb, Willie, Kris, Kris's dog Ruby and I headed up the mountain on a temperate, bug-free night. We munched sweet cherries along the way, spitting pits into the overgrown grass as we dodged the whirling dogs in our path. A pink horizon was finally snuffed by nightfall as we reached the summit. As we unloaded our packs and the dogs slurped from their water bowls, the moon hovered over us like a watchful parent. We were just strapping on our feed bags when Barb suddenly swore she heard our resident moose grunting in the shadows, so she and Kris quickly herded the dogs into the shelter of Allyn's Lodge. As they whimpered and pressed their noses to the windows, we circled the perimeter, straining to see in the fading light. Alas, the moose was gone. So, the dogs were freed and we attended to our feast. Kris's offering was ambitious and delicious coconut shrimp with a tangy, orange marmalade dipping sauce. Like me, Kris is a bit of a perfectionist about her cooking, and was vaguely concerned that she had forgotten limes at the market and had to substitute lemons. One taste made it clear she needn't have worried; the jumbo shrimp were promptly reduced to their little tails. Barb, in spite of work day time constraints, managed to grab some artisan bread, heirloom tomatoes and spanking-fresh mozzarella cheese from a local farm, and served it all with a basil and olive oil drizzle. My salad, as you'll see below, paired roasted green beans and corn with feta and farro - a serendipitous recipe my companions encouraged me to post on this blog. Once the last of the wine was gone and the remnants of our meal packed, we kept our head lamps stowed and descended by the light of the moon. Trailside trees cast shadows at our feet as we gingerly navigated the uneven, dimly lit terrain, regularly punctuated by - surprise! - deeply dug water bars. The dogs were unfazed, blithely galloping into the unknown at full speed, making light of the dark. 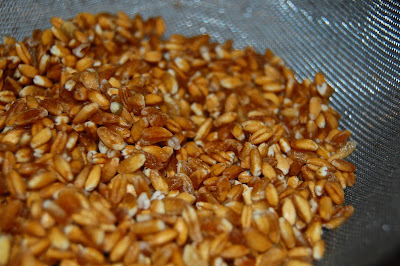 Farro is an ancient wheat popular in Italy for centuries but pretty much unknown stateside until the last decade. Nutritionally, it contains more protein and B-vitamins than contemporary wheat and a lower gluten content. 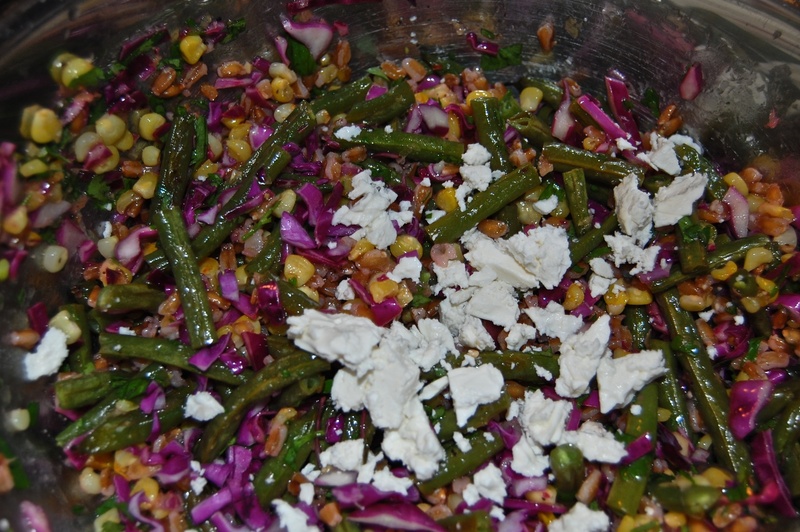 Besides that, it lends fiber and substance to this salad, making it robust and filling. 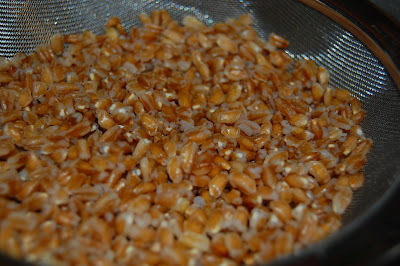 Cook farro according to package instructions. Rinse with cold water to halt cooking, drain well and set aside in a large bowl. 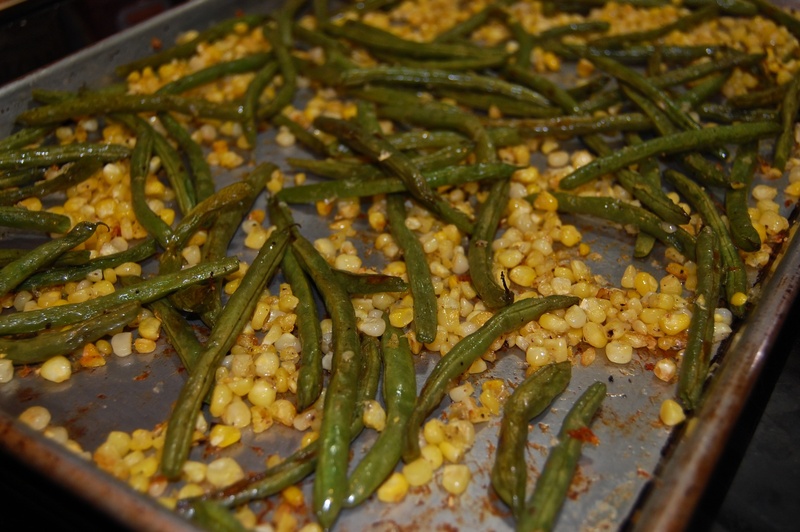 Meanwhile, trim green beans and heap on a rimmed sheet pan. Slice corn kernels from cobs with a sharp knife. Add kernels to green beans on sheet pan. 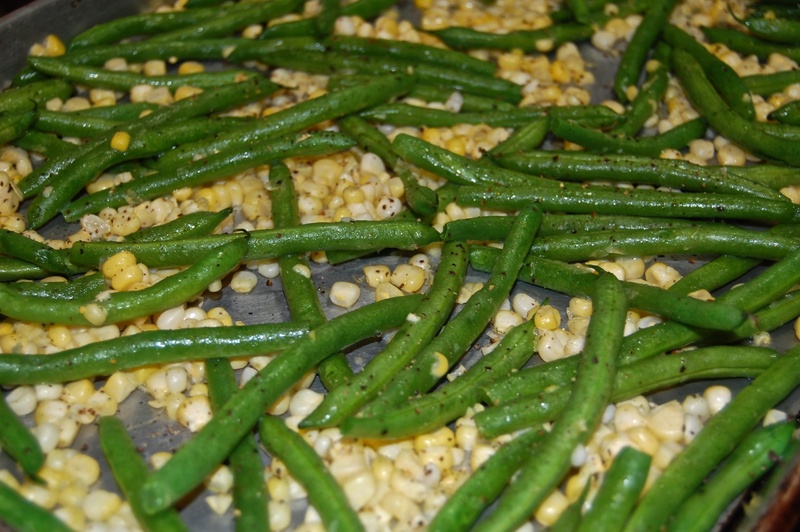 Toss green beans and corn kernels with 1 tablespoon olive oil and 1/2 teaspoon kosher salt, lightly coating them. Spread vegetables out in an even layer and roast 15 - 20 minutes, flipping with a spatula once during cooking, until green beans develop brown flecks and wrinkles and corn is lightly toasted. While vegetables roast, cut cabbage into quarters and core one quarter. Thinly slice cored quarter crosswise into thin shreds, then chop shreds very roughly. 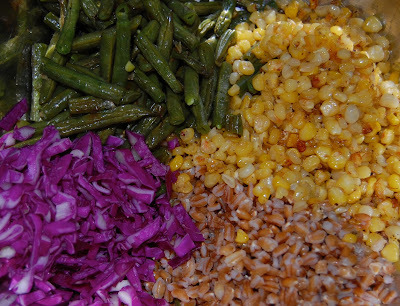 Add roasted vegetables and cabbage to farro in bowl. Add rest of ingredients and toss well. Adjust lemon juice, salt and pepper to taste. Serve at room temperature, preferably under a full moon. 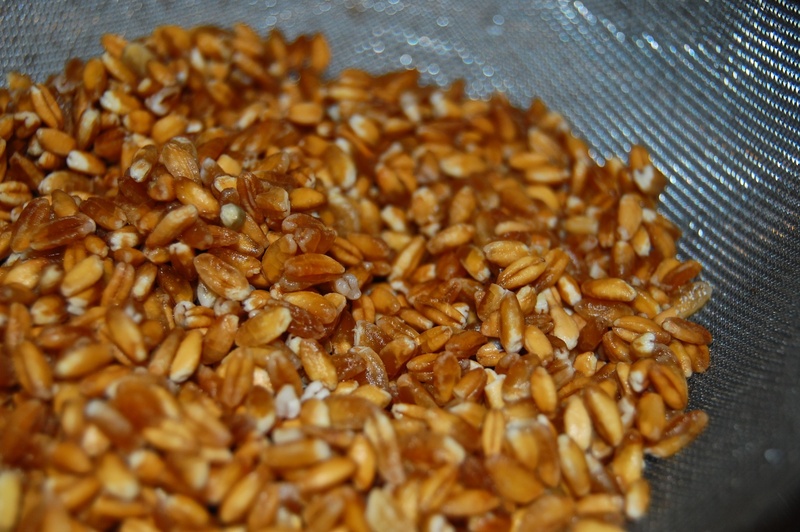 Different brands of farro may have different soaking and cooking times, so pay attention to package instructions for ideal results. I soaked mine 30 minutes, then added to boiling water and cooked another 20 - 25 minutes. Be sure to check farro often as it cooks, and remove from heat when grains start to split but farro remains pleasantly chewy. This salad is packed with vegetables; the farro adds just enough substance and protein to give the whole thing a robust quality, perfect for eating after a hike! If you prefer, replace farro with cooked wheat berries or barley. I used cilantro because I had it on hand, but I think dill or basil would work well too. Mmmm this was really good and packed full of energy too! I have not used farro before but will go directly to the health food store to get some. This is very intriguing and it sounds like a new taste treat is in store for me. And these are beautiful colors together, very pleasing to look at. Thanks Judy! I hope you like it! When I saw the photograph, I knew I had to try this! The colors are beautiful! Couldn't wait for the full moon (close...) and tried it last night. The flavors and textures are as wonderful as the colors! And as always, thank you so much for so many great vegetarian dishes. 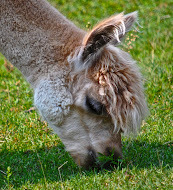 the individual involvement, wordpress.com/ then take into consideration making use of important Official Website pictures in your blog posts. The Facebook page has 4Liker App All Version Free Download For Android, iPhone, PC obtained greater than 3 million choices and 4Liker App also the website gets a huge number of guests constantly. 4Liker A comparable thing runs. plastic or wood and also is little bit greater xtgem.com/ than an increased chair for your infant to sit in.Title This utilized to be the only design Best high chairs Buying Guides of high chair readily available. The Falcons offense was a potent one on the way nfl jerseys to winning the NFC last season, but they didn’t do much with their tight ends. Jacob Tamme, Austin Hooper, custom jerseys store Levine Toilolo, Joshua elited jerseys Perkins and wholesale nfl jerseys D.J. Tialevea were targeted 83 cheap nfl jerseys times in the regular season, which is about as often as wide receiver custom nhl jerseys Mohamed Sanu was the target for passes. One member of that group has spent time game jerseys with quarterback Matt Ryan recently in hopes of taking on a bigger role. Ryan returned to Southern California for more NFL Finger Spinner work custom nfl jerseys with the trainers at 3DQB limited jerseys with jerseys store Hooper, a custom mlb jerseys third-round pick last year, along to run routes and develop custom jerseys a deeper custom nba jerseys relationship with Ryan. Semangat beraktivitas kembali setelah libur yang sedikit panjang..
click on artichoke flower below for flipcards of all posts! Please click on the "comments" button below each post to tell me what's cooking! I'd love to hear from you.